Why do you need to compose an autobiographical speech outline and what is it at all? Its concept is to demonstrate one's personality to achieve a specific goal. If you make a competent self-presentation about yourself, you can achieve significant success in life because a person who understands how to present himself in a favorable light can always find a good job, maintain friendly relations with others, and influence people to achieve any goals. How does one prepare an autobiographical speech and correctly present it? In this case, every detail is important. How To Make Your Autobiographical Speech Excellent? While writing a speech about yourself does not appear to be such a complicated task, there are a number of possible issues that you can face, which is why being aware of some efficient writing tips is not a bad idea! 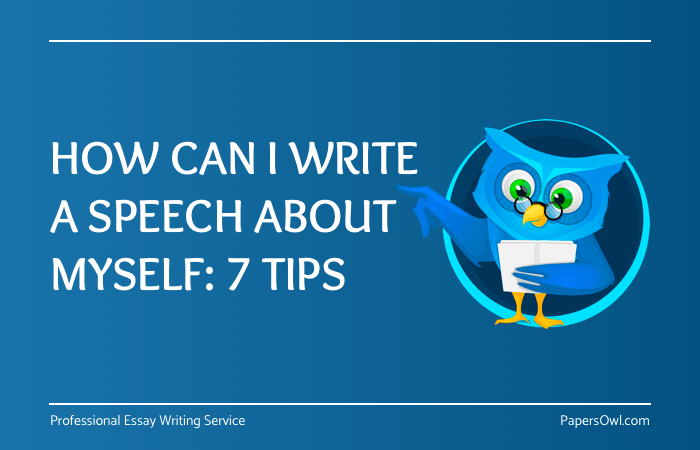 Therefore, if you are not sure how to write a speech about yourself, read the tips below and with their help, you will be able to create a perfect speech regardless of a lack of experience or a tight deadline! who is the audience: the number of listeners and speakers. It is important to plan your paper. First, make it easier for you to track the time of the performance, and secondly, to help you set priorities. Also, when making a plan, move from bigger points to smaller, the points should not be too long. Introduction: The introduction should be short and simple. Start with the greeting and present yourself, state your name and surname, faculty, specialty, and course (if in a university). Add a hook to make it interesting. To make it flawless look for good self-intro speech ideas. Additional education (courses, certificates, training). Employment (you can specify the type and scope of activities in which you would like to work, or the name of the positions that you are interested). It is important to write your speech well. However, it is only one small step in the whole process, after which you should spend enough time to proofread and edit it, making it as good as possible. Writing a persuasive speech should not take much effort. Make adjustments by reading the text again and again. Ask a friend to read your text or listen. It's important to have an independent opinion, and maybe he or she will bring some new speech ideas. If you do not know how to give a speech about yourself, and it will be your first experience, you should pay attention to details. Wear clothes should fit the format and be comfortable. This will always make a good impression on the audience, your appearance will conclude a general impression of you and this is why your appearance should be nice and appropriate. Keep this in mind. Before the beginning of the speech outline yourself, pause - pull out the papers, smile, straighten the microphone. This will set the audience to a dialogue, and you will be given the opportunity to psychologically prepare and assess listeners. Watch gestures, sometimes they speak louder than words. Hands are your helpers, so do not grip them behind your back and do not put them in your pockets, a crossed arm on the chest is evidence of a defensive position or lack of confidence. However, to freeze, like a monument, is also bad as it's unnatural, so ensure that your movements during the performance are light and accurate, slightly subtle and unobtrusive. Believe or not, even public speakers can be nervous before public speaking but for newcomers, they are distinguished by the fact that they know how to cope with the excitement. The simplest thing you can do is to work through the speech, first read it to yourself, then read it aloud several times in front of a mirror. Be sure to ask your family, friends or colleagues to listen to you. This is an excellent opportunity to practice and learn an engaging monologue with a nice tone that doesn't sound like you are reading a piece of paper. It is very important to learn the speech by heart to make your performance great and look confident when you speak in public. It is impossible to write a speech about yourself and make it 100% perfect but who needs it to be perfect? During the performance, anything can happen: the microphone will break, someone will sneeze loudly, or perhaps the lights go out. Whatever happens, keep yourself calm and do appear confused, react with humor and try to somehow beat the situation so you show that you completely control what is happening. At the end of the performance, be grateful to listeners. If you still have any questions on how to write a letter about yourself, just sit and start to write it. Keep in mind that this self-presentation does not end only in your performance. You present yourself further, answering any questions from teachers or people from the audience, so it is important to be ready for it.